If you’ve been a reader of my blog for a while, you may notice that this is a blog post that has been done before. Twice before, in fact. The dining room is a space that I have struggled with since we moved in three years ago and as a result, it’s been an annual update. I have never been able to get it quite right. Its first persona was a dark walled party room with every trend under the sun circa 2016 - edge to edge Downpipe, Sheepskin City, copious festoon lights and more discoballs than Paradise Lost in Watford in 1987. I don’t like to say that I was easily influenced, but Instagram had a lot to answer for. Fast forward one year and I was on a wallpapering roll - wild horses couldn’t stop me with the pasting brush and 50% of the room was draped in a bamboo beauty that transformed the dining room from a room of gloom into Only Fools & Horses on speed. But I STILL wasn’t happy. It’s a long room, with triple aspect and a bar area in the corner and zoning properly it has always been an issue. My dinner parties always start out looking civilised and then deteriorate. We really like to socialise at home. Despite the planning workload, there are countless benefits to having people over for dinner rather than going out. One of the primary ones is not having to leave your home and being able to go to bed immediately that everyone has left, without having to stand in a taxi queue with a load of drunk race goers (believe me, there are a few of them in York). Also, it has to be said that I really love cooking and in a slightly OCD way, the planning involved in entertaining a group of friends. In fact, I will happily admit that sometimes I like the process of food preparation and scheduling even more than the actual event. And don’t even start me on table laying. For me, that activity rates highly in my Top Ten fun activities to do, only slightly lower than charity shop trawling and higher, even, than moving furniture around. Don’t let it ever be said that I don’t know how to live. We’ve had some brilliant dinner parties in our time. I used to have a three course recipe that I took from The Telegraph about ten years ago and it was my absolute dinner party staple for years. It was, dare I say it, supremely impressive yet was one of those fabulous meals that enabled you to prepare the whole lot in advance, thus leaving a plethora of time free for drinking and socialising. It went like this: pre dinner nibbles - almonds, garlic marinated prawns. Starter - crab salad. Main course - roast fillet of beef with beetroot dauphinoise, homemade horseradish and green beans. And finally, the piece de resistance - dessert. A trio of puddings in a row comprising of an almond biscuit with cream and raspberries, chocolate brownie and miniature lemon syllabub. Honestly, ffs, I’m impressing myself just writing it down. Over the last few years as the children have got older and thus, selfishly, less likely to go to bed at 6.30 pm leaving us to have fun, we’ve moved more towards big lunch parties that last just as long as the dinner parties. These tend to be one pot, beef stew or some Ottolenghi room temperature classic affairs which are mainly wine and gin led rather than food heavy. Still fun, but not as pretty, it has to be said. Anyway, when I was planning out the room for the third time (yes, I know), I decided that I wanted to bring back these civilised (sort of), adult focused occasions and make the space feel, well, a little bit more special. We have a large kitchen table which is where we eat family meals, so we’re very lucky that the dining room is purely for entertaining. I wanted to plan a space that was comfortable yet cool, discerning yet decadent but with an edge to it that showed our personality as a family. And also, most importantly that shouted out FUN loud and clear. So what did I do? Inspired by a Pinterest picture, I decided that the best way to improve the bar space would be to make it a proper focal point. And to do this, I needed to tile it. Aided by product from British Ceramic Tiles, I was intent on doing this myself. I’d wallpapered, painted, sanded a floor - how difficult could it be? Quite difficult, it turned out. Actually, laying the tiles was no issue - I used adhesive from B&Q and merrily stuck them to the wall, brick fashion. All was going swimmingly until I attempted to cut them. In life, I have decided that, in the words of Harry Enfield, you need to know your limits. My limit definitely was tile cutting - after a complete lack of success I messaged Martin, the Handyman, who kindly came and finished the job for me. However, I am absolutely over the moon with the result and the tiles have transformed this corner of the room, creating a real focus to the space and adding that extra layer to the look of the bar. Combined with the bar stools I already owned from Cult Furniture, it’s exactly as I had planned it. Absolutely winning, despite my poor tiling skills. I used a wallpaper steamer to take the paper down and it took literally about two hours. Quick as. The room was repainted in Valspar Blanc De Blanc (the other two walls were already this colour) and the room immediately was given a new lease of life. There’s nothing like a splash of white paint to bring the brightness back. I took off the picture shelves above the sideboard and the walls looked brand spanking new. Perfect. More of an obsession than part of the revamp, I’ve been chucking a bottle of gin surreptiously into my trolley on every weekly shop for the last few months. Inspired by Vickie Neave (Inpolife) and her rainbow of gins, I’ve created a rainbow bar of my very own. My life is now complete. In addition, no room of mine seems to be complete without some form of neon and this one from Light Up North is absolutely perfect. The base is mirrored which means it reflects the light perfectly and the colour is a pale green, almost turquoise. I’ve put it above the French doors and it looks great. Emma from Light Up North custom made it and I would massively recommend her if you are looking for something similar - super talented and full of fresh ideas. As always, this is one change that made a massive difference. The unattractive radiators were removed and replaced with gleaming white, traditional colosseum radiators by Tim, the plumber. These are the same radiators from soak.com that I have in my hallway and bedroom and it’s not a lie to say that they are absolutely the BEST. The radiators that were there before were the cheapest of the cheap and a total eyesore - I was very aware of them and actually, I once was moved to block someone who commented rudely about them. They’re now looking good to go and give off loads more heat than the previous ones so a winner all round. Take that, Instagram troll. So a few months ago on a regular jaunt to the local Community Furniture Store, I picked up a G Plan E Gomme long sideboard for the princely sum of £60 (I’m not going to lie, that was a very good day). It’s perfect for the room and holds a significant amount of storage space, perfect for all the other random crap (Joe’s words) I’ve picked up at charity shops over the years. I also repurposed the IKEA shelving unit that I spray painted gold last year - it’s a good contrast to the sideboard and bar and is perfect for displaying some of my vintage coloured glass collection. It’s also ideal for the record player and my record collection, a dinner party staple. If you don’t like The Best Of Bread, you’re not coming in. The green chesterfield sofa fits perfectly in the area opposite the bar and provides extra seating for those who are not lucky enough to grab a bar stool. It’s also the cat’s favourite position and a place to escape when I want to plan an Instagram post and everyone is hounding me for taxi duties, clean clothes, dinner or Fortnite dingo dollars or whatever the f**k they are called. Oh, and it also always looks great and is super comfy. It’s most definitely staying. We’d had the IKEA Norden for years - in fact, this was the second time we had bought it. But it was 2m long and took up more space than was necessary for a table that wasn’t used regularly. 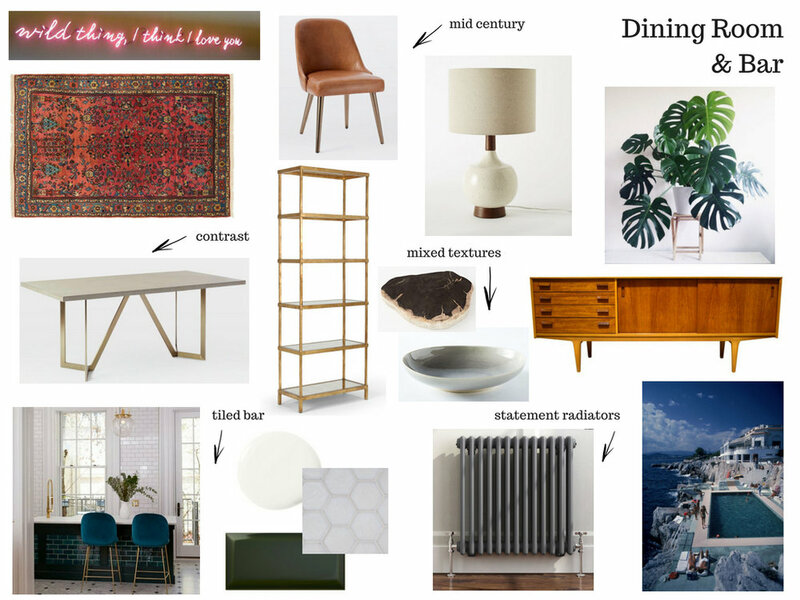 The Tower dining table from West Elm was the perfect replacement - the blackened brass base and concrete effect top ticked every textural box and matched with mid century leather chairs, it’s my dream dining table. Joe’s happy - the chairs are really comfortable which is always his first question with any sort of seating that enters our house - and it’s slightly smaller than the previous table so much more space effective. Combined with the reactive grey speckle dining set and black cutlery, it looks good enough for the fillet of beef three course special. The mint green glass tumblers from Polka are the perfect contrast. A huge improvement and again, transforms the room into a seriously adult space. I grabbed my best ever thrift buy, the large Persian rug I picked up at the Community Furniture Store for £20 last year, and repurposed it underneath the dining table. It’s a great contrast to the concrete and brass and looks good as new in its new space. For the bar area, I used a cow hide that I bought on eBay over ten years ago - again, a good foil for the other layers in the room. Okay, so it wouldn’t be a room of mine without a gallery wall of some description. This one is a biggie - from left of the room to the right, its 20ft long from floor to ceiling. I don’t like to do things by halves. As always, it was great fun to do and there was no plan to it - I started at the bottom left and worked my way across. I used Command Brand on the perspex fronted ones, always my go to when it goes to putting up prints. For the heavy ones, I used small gold picture nails and hooks. It’s a mix of new finds, family photographs, vintage buys, limited edition prints and long term favourites and it makes my heart sing every time I look at it. On the opposite wall next to the bar, I’ve put a favourite limited edition print. I’ve added five art deco mirrors that I’ve collected from charity shops and sales over the years on the wall next to the dining table - every room needs mirrors. I kept the spider lamp that I bought from Rockett St George a few years ago and reused a Heals light over the bar area. I added side lamps - a couple of small ones from Argos Home and a modernist table lamp from West Elm. A large Grande shade from Habitat that I’ve had for years adorns a standard lamp base from eBay and fits perfectly in the corner next to the sofa. No room of mine is complete without bringing the outside in, albeit the poor things are unknowingly on a suicide mission. I already had a large yukka that went well next to the sofa and I added what’s called a pencil cactus (true fact) next to the window, picked up at my local garden centre. Together with a couple of pot plants, this was enough to bring in the green. I’m already praying for their survival. So that’s about it. My job here is done, even though I had to recruit Martin the Handyman to make sure that it was finished properly and not a la Frank Spencer which looked like it might become my signature style. I seriously love my new room and I’m pretty sure that this third revamp will be the last, mostly because I don’t think the poor walls can take any more. Our first lunch party since the finished revamp is next weekend and I can’t wait to make full use of my newly tiled bar and crack open the rainbow, although knowing my friends we’ll be reaching the end sooner rather than later. And who knows, I may even resurrect the trio of puddings. The bar is officially OPEN. I completed this revamp in conjunction with several sponsors who provided their product for my revamp. I would never work with a brand that I didn’t truly love or wouldn’t have in my own home.